PDFs are the universally used format for files and everyone nowadays prefers PDFs over Word or any other format. The only reason for this is that tempering with PDF files is hard and the content can’t be changed very easily. 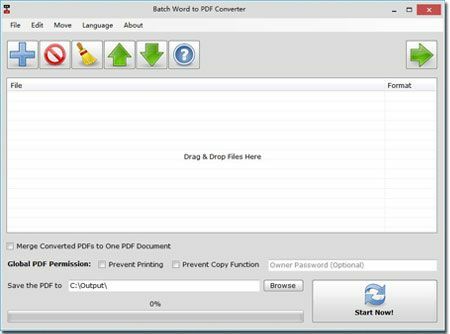 Batch Word to PDF Converter is an app that can help you to batch convert word to PDF in bulk. It can also convert Excel sheets (XLS, CSV, ODF, ODS), Professional PowerPoint Presentations (PPT, PPTX, ODP, ODF), Rich Texts (RTF), and Plain Texts (TXT) into PDF files. With PDFZilla Word to PDF converter, you don’t have to struggle with the conversion of one file at a time because you can convert a bulk of files together. The batch coverts word to PDF acrobat in bulk and can work with every format. It is one of the best Word to PDF converter and it is entirely safe in use. Its operation is easy and it maintains the privacy of the users and keeps the data secure. You are allowed to convert any document to PDF in a bulk, this saves time and efforts and you can easily get the PDFs of the files you wanted. It supports the conversion of more than 10 documents at a time. With this tool, you don’t require MS Office, Adobe Acrobat, or any other Virtual Pinter. The tool works on its own and does not require any other tools. It has its portable version so you can move it from one computing environment to another very easily. It enables you to have privacy settings so that you can maintain your privacy when working with Batch Word to PDF Converter. It allows you to set global authorities for the output PDF and also you can set an owner to manage the password in order to control the security levels of PDF files. You can merge all the converted PDF files into one if you want to. The use of Batch to PDF Converter is very easy and comes with a step by step conversion mechanism. Open the application on your device and click on the “Drag” option and select the Word file or any other supported format file you want to convert and drop them into the file list on the tool’s window. Next step is to choose the folder for your output PDFs, for that click on the “Browse” button. Once it is done, click on the ‘Start Now” button. This will start the conversion. After converting, if you want to merge your converted PDFs into one single PDF then click on the “Merge Converted PDFs to One PDF”. This will combine all the separately converted PDFs into one whole PDF. Batch Word to PDF Converter not only works on the mobile phones but also runs smoothly on the Windows desktops. It can also be used as a portable version with a USB drive. The tool, for Windows, can be downloaded as an EXE installer pr a ZIP version.